Sony Channel invites everyone to its first ever workout party! Sony Fit Fest will showcase how an active and healthy lifestyle is fun! The event will be held at SMX Aura Convention Center on July 7, 2018 (Saturday) from 1pm to 8pm. No need to be a fitness buff to participate in the event because there will be activities appropriate for all fitness levels. So, mark your calendars and tell all your friends as well. The event is a fitness festival that will feature glow-in-the-dark yoga, Zumba, Mixed Martial Arts, and Brazilian Jiu-Jitsu classes alternating with a series of surprise exercise challenges. There will also be a circuit space for those who want to do strength training. “Our goal is to encourage everyone to embrace a healthy lifestyle and to make time for regular physical activity. 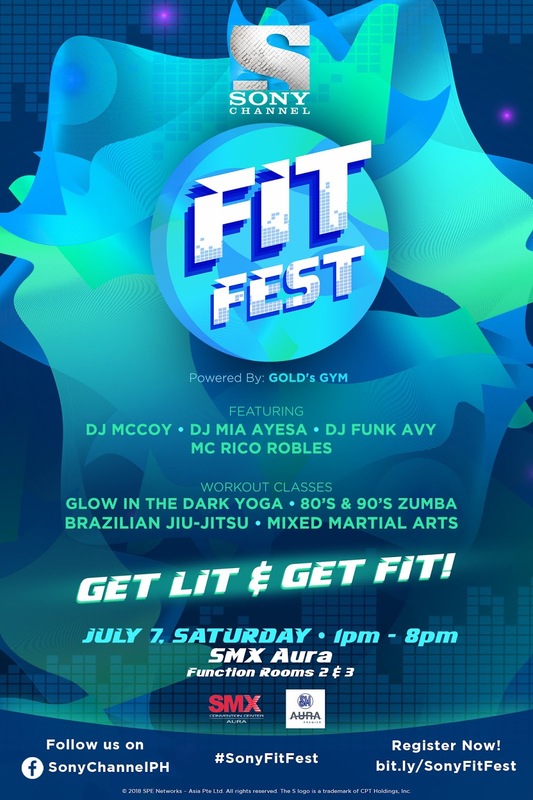 Now is the time to start our journey towards a healthy lifestyle and Sony Fit Fest is the perfect venue for us to do so,” said Armi Malaluan, Director and Business Head of AXN Networks Philippines. DJ McCoy, DJ Funky Avy, and DJ Mia Ayesa will be providing the best beats to work out to with MC Rico Robles. To know more about the event, please visit bit.ly/SonyFitFest. Admission is free! Sony Fit Fest is powered by Gold’s Gym.